After a few months of delay in development, finally, haul for all, the Porsche 911 RSR GTE 2017/2018, for Automobilista by Rafael Cordeiro, under orders from M Tech Sports AV Racing Team. Vehicle configured, to be available, in the Mod EEC Endurance Series Base Mod V2.3. 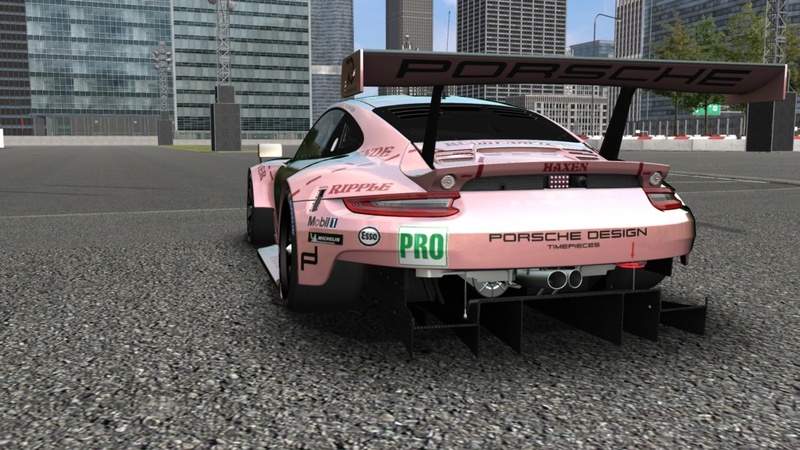 Physics was used the one of the model 911 RSR 2016, which already exists in the current mod, only was made new weight change, due to the central engine, car more stable in relation to the previous model. Conversion made by Rafael Cordeiro, with original base of the car being the game RealRacing 3. In case of any operating problems or bugs, kindly inform me, so that correction is provided. If possible, keep mod availability only in this forum. Great thanks to you mate, this is a great conversion for AMS, now i can run at Le Mans with this jewel, again thanks so much!!! in narrow curves, the steering wheel obscures the view. Can i fix this issues and which files i have to edit? Much appreciated for the update and the car. Just a question, is this the final interior for the car. Just a query and do appreciate the effort, would be nice to see a interior that matches the quality of the exterior. Thank you for the feedback I received from some friends. The file was to be with the mod, but I do not know what happened, in the file compressed in my HD, the template is included. 2 - On the steering wheel, I will see with the developer, if it is possible to do something about it. 3 - On the pilot's arms in the cockpit, I do not know if the original source file of the car has, I'll check with the developer. Soon, a new version, converted from Assetto Corsa, is available, the car is already under development, but the developer, did not inform me a forecast to release the Assetto Corsa version of the 911 RSR. Thanks for everyone's feedback, whether positive or negative. Thank you for keeping us up to date. Another cool feature would be to use gonzo-kool's GTR2 sound released at GTR2 section here ,maybe you got permission to use it. With the launch of the Endurance Pack for rFactor 2, soon we will have the version 2.0 of the Porsche 911 RSR, converted direct from rFactor 2. As I continue, I will announce here for now to take advantage of the current model. i would be really surprised if you can convert that new DLC from rFactor 2.
looking forward to seeing that, then i would like to have the M8 GTE. My friend who did the conversion of this 911, said that it might be able to do the extraction, because he saw in some forum, that are managing to break the encryption. If it does, the 911 RSR and the BMW M8 GTE are already ordered, and as soon as they are functional, you can be sure that I will make it available to friends. i would rather do the cars on my own but i would like to know more about the encryption crack. you can also pm me if you don´t want to share that info here. @MarcoDeAndrade wrote: My friend who did the conversion of this 911, said that it might be able to do the extraction, because he saw in some forum, that are managing to break the encryption. I haven't looked to see yet if these cars followed the newer encryption (was first used in the GT3 pack). I'm also interested in seeing what is used for this. So, my friend did not reveal the source of his information, about the Rf2 encryption break, but as soon as I have this information, I report. all i know so far is that nobody is able to crack it until now. @Triebie wrote: i would rather do the cars on my own but i would like to know more about the encryption crack. Awesome work with this skin Triebie, sorry for aks but this car is available to download? Hello guys. I apologize for the delay, I've been ill these past few days and I hardly had access to the computer. Unfortunately my friend gave me bad news about the breach of RF2 critpgorafia. He tried in many ways, in addition to his other friends, and no one was successful. They will try for some more time, if they succeed, they will let me know and I will inform you next. On the skins of Le Mans 2018, soon they must be available, I ask that they wait a little more. @MarcoDeAndrade wrote: Hello guys. I apologize for the delay, I've been ill these past few days and I hardly had access to the computer. Unfortunately my friend gave me bad news about the breach of RF2 critpgorafia. He tried in many ways, in addition to his other friends, and no one was successful. They will try for some more time, if they succeed, they will let me know and I will inform you next. I just want to ask that how can I play with this specific car with AI around? I noticed that this car is slower than the AI. (On difficulty level 107% at Road America and Lime Rock Park there is a 2 second gap between me and AI). Maybe I should set something for the car? About the above comment, the car being slower, than other original mod cars, but is someone having the same problem? If so, let me know, as long as I can see with the developer, what can be. Hey man, thank you so much for this car....thank you buddy for me as well. I am also seeing a big difference in performance from the 911 RSR to the ECC GTE cars. Roughly 5 seconds per lap around Spa. Sorry for the delay in giving some position on the mod. I've been unemployed in the past few months, and with the job search, some things have not changed. I checked with the developer, and unfortunately for now, we will only have this version. A new version is being developed, converted from the Assetto Corsa, which should be launched soon (an exact deadline was not given).